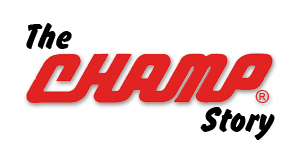 Champ Frame Straightening Equipment was founded in 1981 and was the first company to offer a complete post-based system for uni-body repair. While other companies were importing their (expensive) technology from Europe, Champ was being innovative by combining the newer holding and measuring equipment with existing pulling and tie down equipment. Floor pull systems had the advantage of quick and easy pulls at a low price. The floor is your work base and it takes the place of heavy steel ramps such as those found on frame racks. Champ has a method to give the body shop technician the low cost and speed of a pulling post with the precision of a three-dimensional measuring system – all wrapped up in a package most any body shop can afford. Champ has acquired a reputation for quality and service. Careful attention to every detail goes into each Champ product – quality you can be assured of.